My dear Fathers, I wish to thank most of you for having sent your parish pastoral plans for this year. As I announced last month, we have appointed a task force to assist in the implementation of the parish programs. It has met several times and they have presented already at the May Clergy Recollection their report and the proposed program. 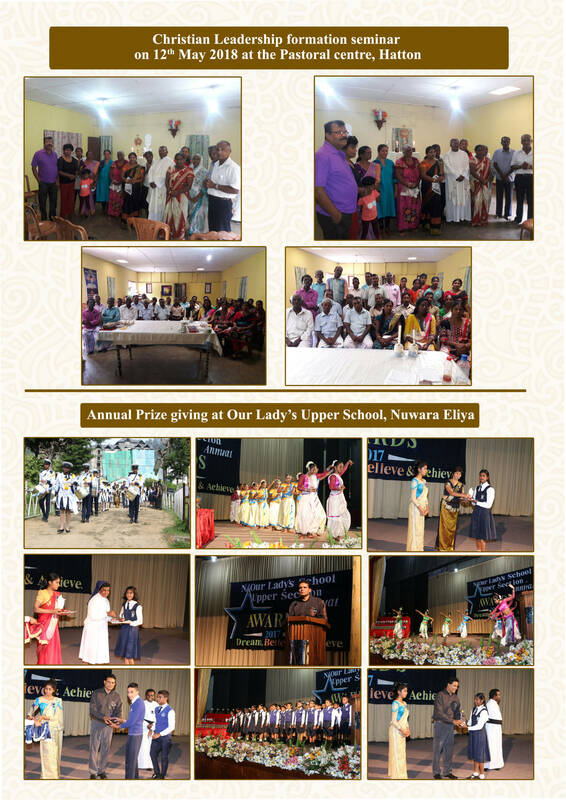 I am particularly grateful to them for the laity animation programme they will conduct in the three vicariates. According to their target six hundred lay animators will be formed through this program. I therefore wish to solicit the collaboration of all parish priests and vicars forane to make the maximum use of this opportunity to get your lay leaders formed. I am happy that at long last the parish hall in the Bogawanthalawa parish has been completed. 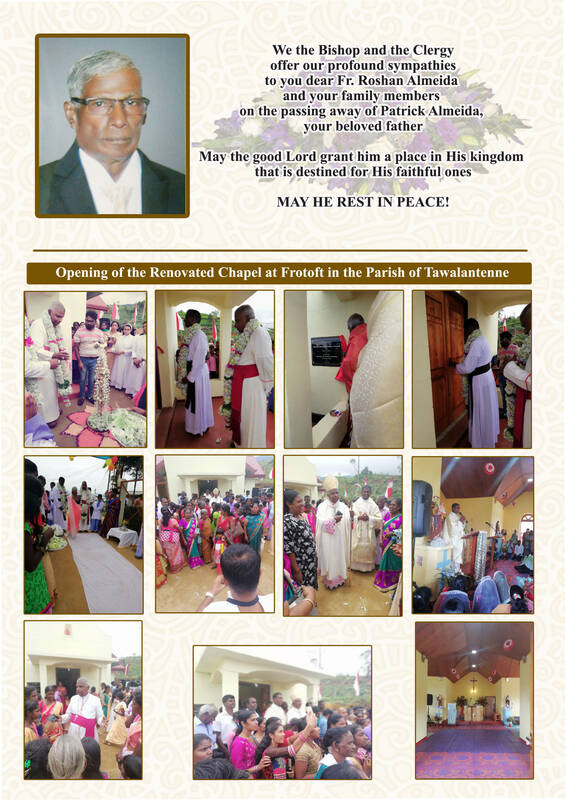 Our congratulations to the parish priest Fr. Edwin Rodrigo for the quality of work in the parish hall which can now be utilized not only by the parishioners but also by others for a payment that will enhance the revenue of the parish of Bogawanthalawa. Facilities have been made available also for accommodation for a number of people. 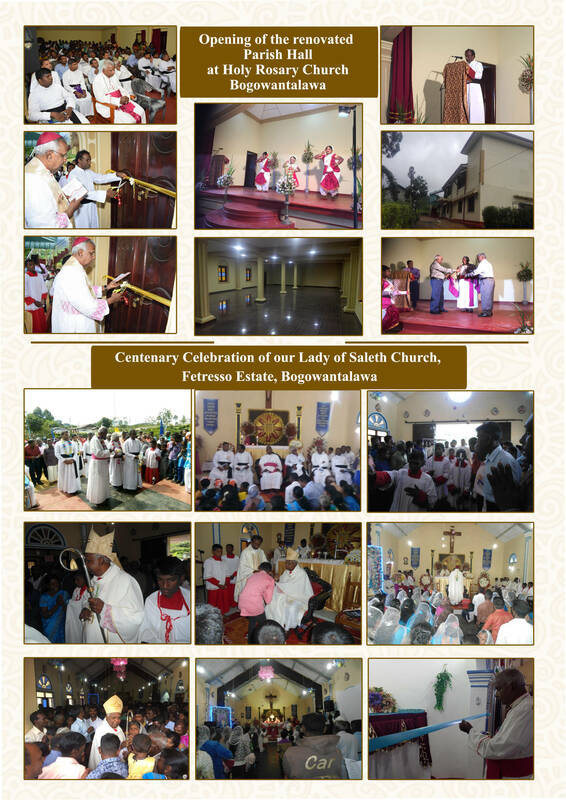 In a place like the parish of Bogawanthalawa which is in one corner of the diocese this venture will be a real asset even to the poor people to have their wedding receptions without having to pay exorbitant-amounts to others. On the 17th of June,the Pope’s day is to be celebrated on the theme “You are the sign of Reconciliation” Needless to mention that the theme is particularly appropriate for our country. Let us make our celebration of Pope’s day a meaningful one by hoisting of Papal flag at the beginning of Sunday Masses (It could be carried at the entrance procession and placed in the sanctuary at a prominent place) We have to pray very much for our universal shepherd who is endeavoring to give a leadership to the church in the midst of many challenges from within and without. Let us remember to pray for the Auxiliary Bishop elect of Colombo namely Msg J.D. Anthony who will be ordained to the Episcopate on the 23rd of June at 9.30 am at St. Lucia’s Cathedral, Colombo. All the arrangements are being finalized for the feast of St. Anthony, the Patron of our Diocese, and our Cathedral as well as at the Shrine of Wahacotte. Wahacotte feast will be on the 16th &17th of June. Please encourage our faithful to make the pilgrimage to Wahacotte as it offers them an opportunity to receive the Sacrament of Reconciliation and to be renewed in their faith. 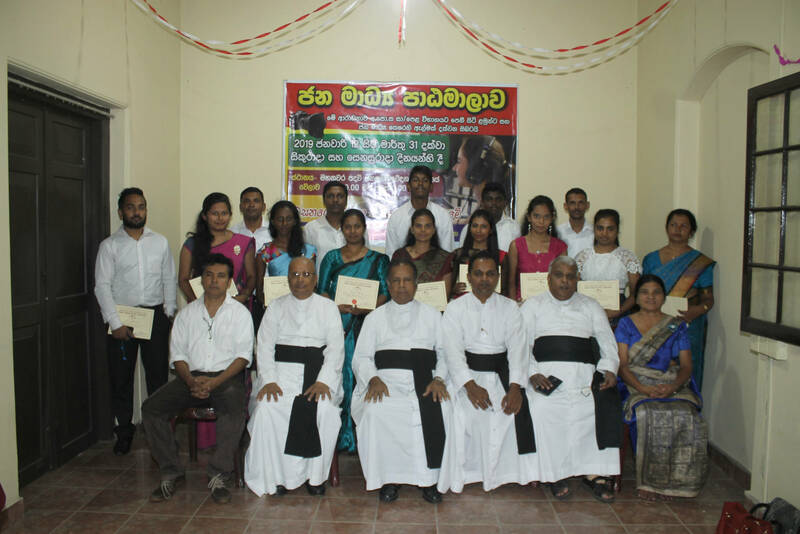 The house for retired priests at Katugastota has been refurbished and it will be named as “Divine Heart Rest”. There will be a Holy Mass for the late Ms. Noeline Roberts, our benefactress and the house will be officially inaugurated on the 4th of June. Wishing all of you God’s blessings. “Divine Heart Rest” There will be a Holy Mass for the late Ms. Noeline Roberts, our benefactress and the house will be officially inaugurated on the 4th of June at 10.00 am. “Now, with the new forms of consecrated life, he is so creative, with the charisms … He is the author of diversity, but at the same time is Creator of unity. This is the Holy Spirit. And with the diversity of charisms and many things, he makes a unity of the Body of Christ, and also the unity of consecrated life. And this too is a challenge.” Francis posited that the Holy Spirit wants prayer, poverty, and patience to stay strong in consecrated life. For the consecrated person, prayer is “turning always to the first call … to that Person who has called me,” he said. Consecrated life is a call to renounce all things for the sake of the gospel, and for the consecrated person “every prayer has to turn back to this … prayer is that which makes me work for the Lord, not for my interests or for the institution in which I work, no, for the Lord.” Pope Francis reiterated that for the consecrated person prayer is a return to the meeting with the Lord in which they were called by him. “And prayer, in the consecrated life, is the air which makes us breathe that call, renew that call. Without this air we could not be good consecrated persons. We would be perhaps good persons, Christians, Catholics who do many works in the Church, but consecration you must continually renew, in prayer, in an encounter with the Lord,” he said. CNA contacted the Holy See Press Office about these unclear remarks concerning prayer and those living in the world, but did not receive a response by deadline. The Pope went on to say that there are no excuses for not devoting time to prayer, including busyness, pointing to St. Teresa of Calcutta as an example. Someone might say: “But I’m busy, I’m busy, I have so many things to do,” he pointed out, stating “[prayer] is more important: Go pray.” St. Teresa of Calcutta had concerns, he acknowledged, yet “the two hours of prayer before the Blessed Sacrament, nobody took them away from her… Do as she did, do the same.” Another reason prayer is so important for men and women in consecrated life, he said, is that it helps to direct action to the correct purpose, keeping the focus on God, instead of just serving an institution or one’s own interests. “Search for your Lord, the one who called you… Not just in the morning,” he said. “Everyone must look for how to do it, where to do it, when to do it. But always do it, pray. One cannot live the consecrated life, one cannot discern what is happening without speaking with the Lord.” Pope Francis then turned to poverty, which he noted St. Ignatius of Loyola called the mother of consecrated life. “Without poverty there is no fecundity in consecrated life,” he said. The spirit of poverty is necessary for discernment, and is a defense against all that would destroy consecrated life. Wishes from one of our priests to our Bishop…………. Here am I, sending my sincere wishes as you complete 35 fruitful years in your Episcopate. Thank you, once again for your dedicated life, leadership and service to us and to the Church. You have been a great leader and a role model of Faith which has helped us over the years to grow in our life and ministry despite our own limitations and shortcomings. I’m so very grateful to you for giving me so many opportunities that have transformed my life and ministry into extraordinary ones. Thank you for helping me to grow in my faith through experience. You have granted me the responsibilities and occasions to work with you, but you also guided me and made me strengthen my focus on all that I ever wanted to achieve. It will never be forgotten. 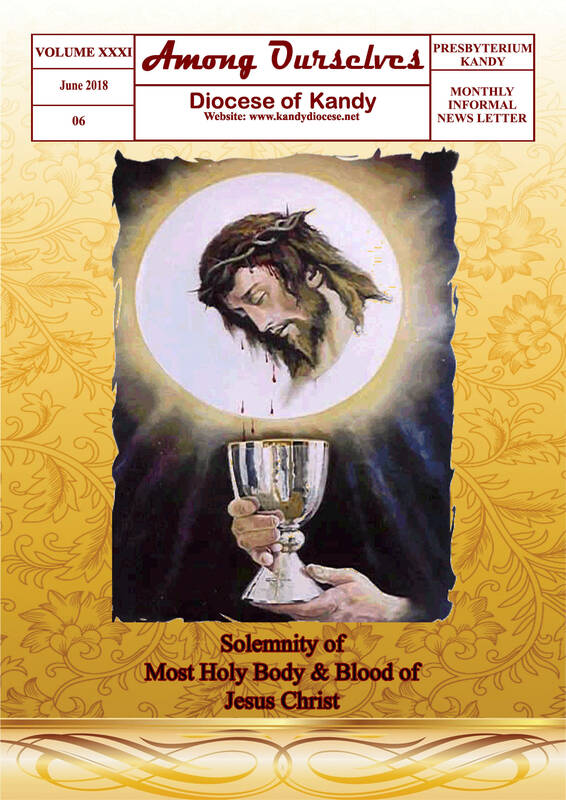 Corpus Christi – Holy Body and Blood of Christ The Solemn feast that is celebrated on the Thursday following Trinity Sunday (or on the second Sunday after Pentecost) is the feast of the Most Holy and Precious Body and Blood of Jesus. Why is this day so special? Find out, through this article. “I am the living bread that came down from heaven; whoever eats this bread will live forever; and the bread that I will give is my flesh for the life of the world.” (John 6:51) Having celebrated the birthday of the Church on Pentecost and the solemn feast of the Trinity, we come down to the feast of the Institution of the Eucharist to commemorate the highest gift ever given to mankind. The ‘Real Presence’ of Jesus Christ is celebrated and venerated through the Eucharist and the Exposition of the Blessed Sacrament. The solemn feast celebrates the institution of the Holy Eucharist which occurred at the Last Supper. It is considered to be a Day of Obligation or compulsory attendance in church. 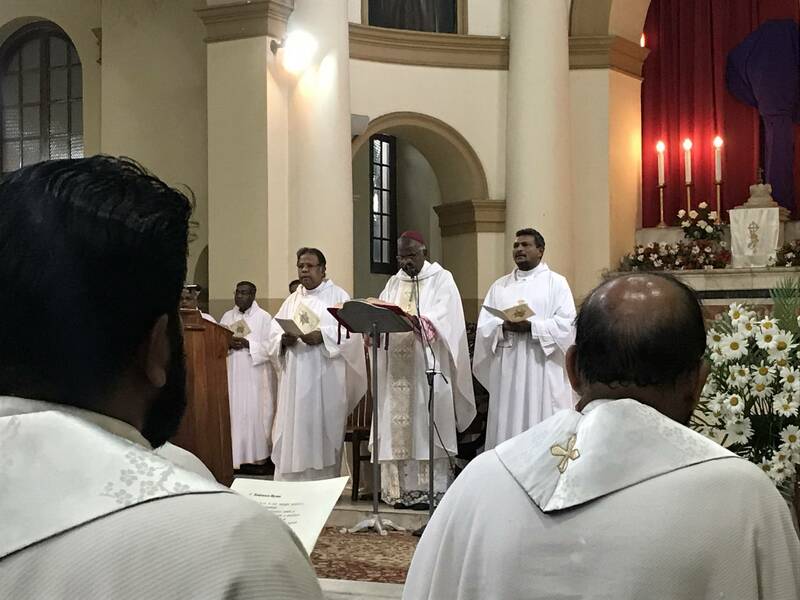 Services include a solemn procession with the Consecrated Holy Eucharist which proclaims the fact that Jesus resides within every baptized Christian. History The Latin name, Corpus Christi is understood as ‘the body of Christ’. The feast itself was promoted by Saint Juliana of Mt. Cornillon, a nun who was in awe of the Eucharist. She yearned for a solemn feast to venerate the Eucharist; according to her not observing such a solemn feast was not befitting the Church and proposed her views to Robert de Thorete, the Bishop of Liège. Bishop Robert de Thorete then convened a synod (council) and hence, initiated the celebration of the feast of Corpus Christi in 1246. The feast gained a universal momentum only after Pope Urban IV issued a charter in 1264, asking Christians to observe the Thursday after Trinity Sunday as the feast dedicated to the Eucharist, giving the feast a solemn status. Pope Urban also requested St. Thomas Aquinas to compose special hymns and prayers to commemorate the feast. The Query: Why is there a special feast to commemorate the Holy Eucharist when we already celebrate it on Maundy Thursday? Maundy (Holy) Thursday, as you know, celebrates the feast of the Last Passover, which in essence, is the Institution of the Eucharist. Maundy Thursday, undoubtedly, celebrates Jesus’ Sharing of Bread with His apostles; besides, it also commemorates the institution of priesthood, and of the commandment of ‘doing unto others as Christ had done to them (the disciples)’. However, the solemn feast gets subdued by Christ’s death on the cross, becoming the greatest Sacrifice of Christ. On the other hand, the feast of the Most Holy Body and Blood of Jesus commemorates the Communion with God achieved through the Eucharist. The Feast of Corpus Christi allows us to venerate God and most importantly, gives praise and thanksgiving for the Gift of the Presence of Christ that is manifested through the Eucharist. The feast is a memorial of Jesus’ command to partake in His Body and Blood through the sacrament of the Holy Eucharist. Through the Eucharist, Christians are presented an opportunity to be aware of the presence of Christ in each member present in the church as well as the Bread that is Broken on the altar and presented to them as the Body of Christ. In the words of St. Thomas Aquinas, the sacrament is best understood as, “the proper effect of the sacrament of the Eucharist is the conversion of man into Christ, so that he may no longer live for himself, but that Christ may live in Him”. Eucharistic Elements Bread and Wine are the elements of the Eucharist which when consecrated become the divine Body and Blood of Christ, respectively. ‘The Bread that is Broken and Wine that is Poured’ stands for the Sacrifice of Jesus on the Cross. Water A droplet of water is added to the wine just before the rite of consecration. The mingling of water represents the union of Christ and the church. Chalice and Paten The Chalice is a gilded gold or silver cup that holds the wine that is transformed into the Blood. The Paten is a gilded silver or gold plate that holds the Consecrated Host. Only the priest and deacons are permitted to touch the Chalice and the Paten. Ciborium A larger version of the chalice, the ciborium comes with a lid and is used to hold the consecrated Bread used for communion. The Ciborium is always kept covered with a veil and placed in the tabernacle. Cruets Cruets are tiny vessels preferably made of glass that are used to hold the water and wine before it is transformed into the blood of Christ. Monstrance It is used to hold the consecrated Host during Benediction and Processions on Corpus Christi and Holy Thursday. The monstrance is made of gold or silver in a radiating sun shape with a clear glass area for hoisting the Sacrament. The monstrance which contains the Sacred Host cannot be touched by lay people; so, giving due respect to the Blessed Sacrament, the priest holds the vessel with a veil. Liturgy of the Eucharist The entire mass is focused on the Liturgy of the Eucharist, making it the most important part of the celebration. The Liturgy of the Eucharist in essence is the commemoration of the institution of the Paschal Sacrifice as instituted by Jesus Christ at the Last Supper. The celebration of the Eucharist involves Offering of the Gifts (that is the bread and wine) on the Altar, followed by the Prayer over the Gifts which is followed by the epitome of the mass known as the Eucharistic Prayer. The Eucharistic prayer includes prayers of thanksgiving, memorial acclamation, invocation to the spirit, consecration, transubstantiation and final doxology. The Eucharistic Prayer is followed by the recital of the Lord’s Prayer, the Giving of Peace or the rites of Peace. This is followed by the Breaking of Bread and inviting the congregation to partake in the Body and Blood of Christ known as Holy Communion. On the Feast of Corpus Christi, just like on Maundy Thursday, the Altar is stripped off the Missal and stand, post Communion to set the Monstrance in which is placed the Consecrated Host. The Priest, Deacon or the celebrant then genuflects before the exposed Blessed Sacrament, the congregation follows suit and a few minutes of silence is observed. The Priest/Deacon recites the ‘Tantum Ergo’ after which the Congregation moves silently in procession. Eucharistic Procession The solemn feast is celebrated with a procession that is led by the Priest who carries the Most Holy Eucharist that is consecrated during the Eucharistic celebration. The procession that is carried out immediately after the mass, is in essence, the prolongation of the celebration of the Eucharist. The procession is a means for the Christians to publicly display their faith and reverence for the Blessed Sacrament. During the procession, the congregation follows the priest bearing the Blessed Sacrament with lit candles, proclaiming their belief in the real presence of Jesus. The procession proceeds slowly and solemnly with the congregation partaking in hymns and prayers during the procession. The procession culminates in the Church where it is followed by Benediction, after which the Blessed Sacrament is exposed on the altar of Repose. Tradition and Symbolism The Christians partake in the Mystery by attending mass, and receiving Holy Communion. It is considered an auspicious day for those receiving the Body and Blood of Christ for the very first time. The Procession of the Blessed Sacrament is welcomed with a carpet of red and white flower petals and banners depicting any of the Corpus Christi symbols. The color of the day is white with red or red with white, symbolizing the Body and Blood of Christ. The priests, deacons and altar servers wear vestments in white and red. The altar, too, is decorated with red and white flowers with altar cloths of the same colors. During the exposition of the Blessed Sacrament, the altar is decorated with six candles; three on either side of the monstrance. The other symbols include Bread and Wine or the Paten and Chalice. A loaf of broken bread and a bunch of grapes are other symbols of this solemn feast. A peacock feeding on a bunch of grapes is another symbol used to commemorate Corpus Christi. Corpus Christi is a feast to proclaim our solidarity with Christ and with our neighbor. Venerating Jesus through the Holy Eucharist and The Blessed Sacrament, we stand to testify the grace of Christ, and with one voice we can truly sing, “We are one, one in Jesus, we are One in the Lord, one in heart, one in soul.” Have a Blessed Feast! For the common man, it is through these symbols that they can base their understanding of complex religious philosophies. In the spiritual realm, these objects, signs, and symbols take on the role of acting like a badge of faith as well as a teaching tool. You can even call these objects as the means to distinguish and identify one religion from the other. Symbolism may be defined as the investment of outward things or actions for the expression of religious ideas. While the cross, crucifix, and the rosary are well-known symbols used to identify followers of Christ, the Catholic Church has many more symbols and objects that sets them apart. These symbols are a vital part of the Catholic religion, and needless to say, each has its own deep significance. Symbols of Christ 1. Cross : A symbol of sacrifice, hope, and salvation, the cross is one of the most popular symbols of Christianity. Rightly called the wood of Christ, it is a reminder of Jesus’ death by being nailed to a cross. However, it represents Christ’s victory over sin and death, and translates to being a beacon of hope for Christians. 2. crucifix : The crucifix is nothing but a depiction of the cross that reveals the body of Christ as a reminder of the suffering and sacrifice made for mankind. The crucifix adorns the walls of homes and churches of Roman Catholics. It is placed facing the priest on the altar and facing the congregation above the Eucharistic altar. It is, in truth, the ultimate symbol of sacrifice. 3. bread and wine : Considered to be the holiest part in a Eucharistic celebration, the consecrated bread and wine are seen as the Body and Blood of Christ sacrificed on the altar. The priest and the laity become one in Christ after receiving the Holy Communion. 4. Alpha and Omega: Seen on the paschal candle, as well as on the vestments of the priest, the symbols of Alpha and Omega stand for Christ being the beginning and end of all things. They are also the first and last letters of the Greek alphabet. 5. Chi Rho : Inscribed on liturgical items, vestments, gravestones, sacred vessels, and plaques, the Chi Rho is a symbol of Christ. Superimposed on one another, the Greek letters chi (X) ―corresponding to the ‘Ch’―and rho (P)―corresponding to the ‘r’ of Christ―are often rendered in the form of a cross. 6. IHS: Essentially a Christogram, the IHS―also known as JHS, JHC, or IHC―is the Greek equivalent of the name of Jesus. Like the Chi Roh, IHS is superimposed on one another, and is used on liturgical vestments, vessels, as well as on the bread that is distributed as Holy Communion. 7. Ichthys : Ichthys is represented as two arcs intersecting to form a fish. ΙΧΘΥΣ is an acronym for Iēsous Christos, Theou Yios, Sōtēr, which translates into English as “Jesus Christ, God’s Son, Savior”. The symbol of fish is a brief profession of faith in the divinity of Christ and acknowledging Jesus as the redeemer of mankind. 8. INRI : Seen inscribed as a banner on the crucifix, INRI is the acronym for the Latin phrase Iēsus Nazarēnus, Rēx Iūdaeōrum. It translates to Jesus of Nazareth, King of the Jews. It is the title given to Jesus by Pontius Pilate, the Roman governor who ordered it to be inscribed over the cross on which Jesus was crucified. 9. The Lamb of God is a title rightly given to Christ by John the Baptist. There are many instances where Christ is referred to as the Lamb who sacrificed his life on the cross, thus, becoming the Paschal lamb or sacrificial lamb who redeemed the world by shedding His blood. 10.shepherd with his sheep : Depicted as a shepherd with his sheep, it is used as a title with reference to Christ. Jesus is called the good shepherd―the one who leads his flock to greener pastures as well as gives rest to the weary soul. 11. sower with seeds : Christ is considered to be a sower with seeds of faith, hope, and redemption. Christ is likened to being a farmer who goes about sowing his seeds with a hope that it will bear good fruit. Health first ! Good advice from Dr Harold……………………. Some people are still worried whether to eat eggs or not If an egg can hatch and produce a life, it has all the nutrients that are required for the wellbeing of a human life. It has an amazing range of nutrients, so much so that taking vitamin supplements by some people should be considered a waste of money, and the saying goes that by taking vitamin supplements you feed the fish in the ocean. Eggs carry a bad reputation because of the high content of cholesterol. Each egg has nearly 200 mgs. Once, it was nicknamed as a “Ball of cholesterol” But today, the researchers have proved that cholesterol in an egg does not influence the blood levels of cholesterol in most people and may have a minimum effect on others. You can eat 6-7 eggs a week with no risk of any heart disease. There really isn’t much scientific evidence for such limitations. Your liver produces cholesterol from the saturated fat you consume, and dietary cholesterol as in eggs, are excreted by the liver in the bile salts. Most people enjoy eggs with bacon for breakfast. Bacon has high saturated fat content and that would influence the cholesterol level in blood. So, eggs are best eaten with vegetables such as spinach, mushroom, tomato, avocado with wholegrain bread rather than bacon and white bread. A single egg has vitamin B12, B2 (riboflavin), vitamin A, vitamin B5 (pantothenic acid), vitamin E, and selenium. Eggs also has calcium, iron, potassium, zinc, manganese, folate and many more. It has highest quality protein 96gms0 and 5 grams of fat and a trace of carb. If you want to lose weight, it is a good idea to eat eggs in the morning so that you will not feel hungry and increases satiety and helps lose weight.. Furthermore, each egg has only 77calories.You could afford to eat two eggs with breakfast. Emma Moroni, an Italian woman died last year at the age of 116, and her doctor could not stop her eating three eggs for breakfast every morning. She used to eat two raw and one boiled. Then, there was Jean Calment a French woman who also died at the age of 116 and when she was asked what her secret of longevity, she said, I eat bacon and eggs every morning for breakfast. Most of the nutrients in an egg is in the yolk and the white contains mostly protein. New studies have shown that eating eggs improve your cholesterol profile. Eggs seem to raise HDL the good cholesterol and has no effect on the LDL the bad cholesterol. Eggs have high levels of Lutein and Zeaxanthin. People who run the risk of Macular Degenerations and cataract in the eyes should eat eggs because lutein and Zeaxanthin seem to prevent and reduce the risk of such diseases. Choline is found in a few foods like liver poultry fish, dairy foods, pasta and rice and eggs have a lot of it. Spinach, beet and shellfish are also a good source of choline. It is supposed to be a brain nutrient. Protein in eggs is very high quality and proteins in other foods are assessed comparing with egg proteins. Athletes, bodybuilders, and sports people must eat eggs daily to increase their muscle mass and for better bone health. The healthiest eggs are from hens raised on pasture. Those eggs have high levels of omega-3 fatty acids. These hens are also fed with flax seeds. The eggs that you buy from the supermarket are conventional eggs. The hens that lays these eggs are fed grain, supplemented with vitamins and minerals. In Sri Lanka, in the villages we have pastured eggs where the chicks can roam freely, eating insects, grass, worms and making their ‘buk, buk’ sounds. Pastured eggs are supposed to be the healthiest. Conclusions: Do not ask anymore whether eggs are good for you or not. Just eat even three eggs a day, and there is no risk of any disease. There is one drawback. The microbes in your large gut breakdown foods, including red meat, eggs and dairy and produce a molecule called trimethylamine N-oxide (TMAO). This chemical causes greater blood vessel inflammation and clotting of blood leading to heart disease. Studies have shown that if you suffer a heart attack and the TMAO level is high, your prognosis is bad and likely to die, have another heart attack or stroke within the next few months. For that reason, reduce your intake of eggs, red meat and dairy. Eating two eggs a day would be wiser than more.